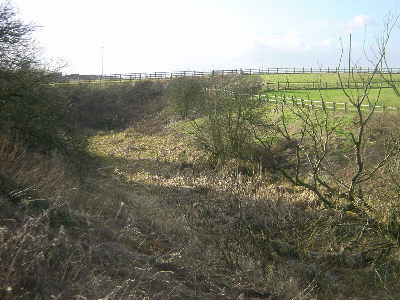 Above the four Waterhouses Locks is the junction with the Fairbottom Branch, which ran eastwards for about a mile to Bardsley and Fenny Field Bridge. 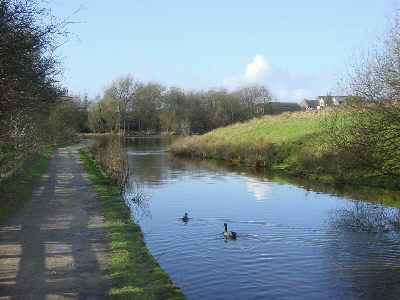 This virtual walk now continues straight ahead along the main line of the canal towards Crime Lake. 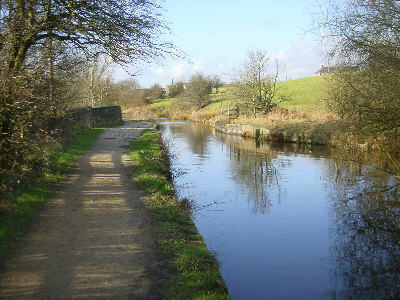 Looking back to the fourth lock, with the Fairbottom Branch to the left. 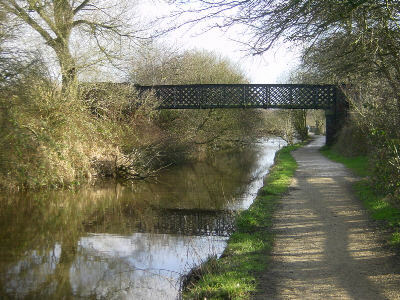 The canal passes below a wrought iron footbridge that provides access to Pinch Farm. 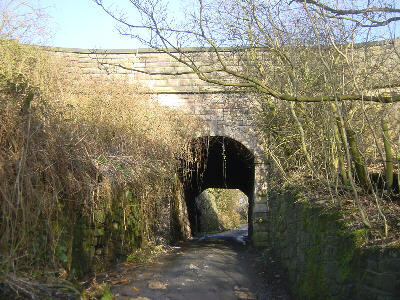 The aqueduct crosses the steep and narrow Crime Lane. The canal soon opens out into the wide expanse of Crime Lake. This was created accidentally during the canal construction. 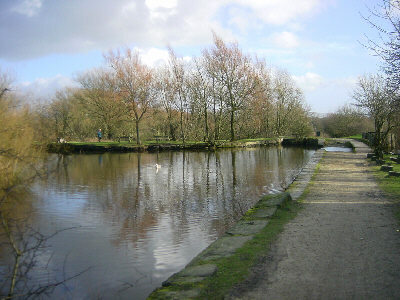 An embankment was built to carry the canal across the steep-sided valley of Wood Park Clough, with a culvert to take the small stream below. However, part of the embankment collapsed, blocking the culvert. 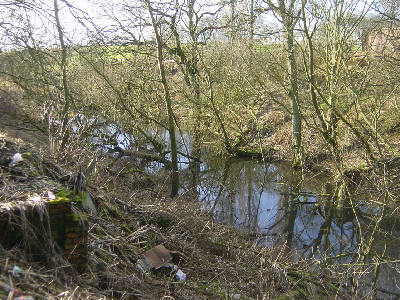 This caused the stream to flood and fill the valley behind the embankment, submerging two cottages. 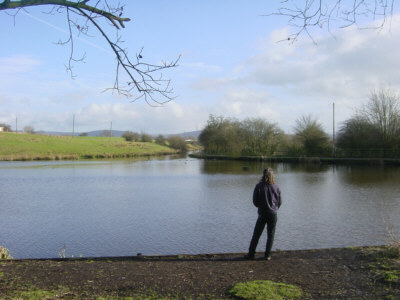 It was decided to leave it as a lake and eventually, the upstream side of the canal became washed away, joining the lake to the canal. 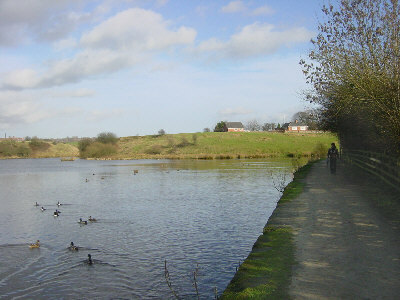 The lake became a popular destination for days out, with tea rooms and boat houses. Rowing boats were available to hire and the steam boat Pioneer ran passenger trips to Failsworth and Bardsley. 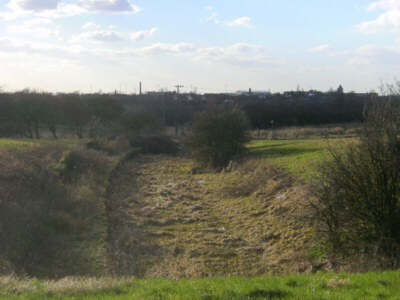 Looking towards the site of Crime Bridge. There are several suggestions about the origin of the name "Crime". The name existed in the area before the lake was created and was originally spelt "Chrime" so was probably not connected with any felony! 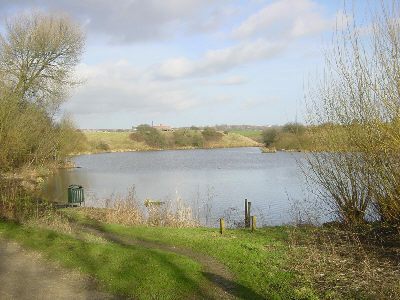 In the days when Daisy Nook and Crime Lake were a magnet for days out, the area around Crime Bridge, at the western end of Crime Lake, boasted several tea rooms and refreshment stalls. Crime Bridge was infilled in 1961 so that the road could be widened. 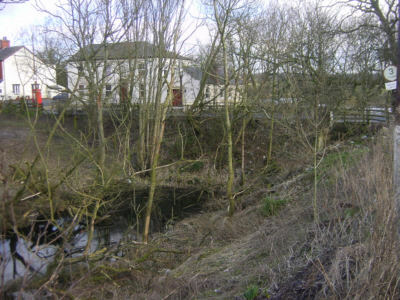 Beyond here, the canal is in water for a short way, but overgrown with trees. It then continues in a dried-up state for 100 metres or so in a cutting. 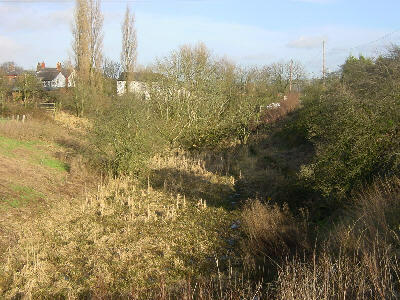 Overgrown canal west of Crime Bridge. Looking back towards the infilled Crime Bridge. Dried up section between Crime Bridge and Woodhouses. The lights of the motorway can be seen beyond. The infilled channel looking back towards Crime Bridge. 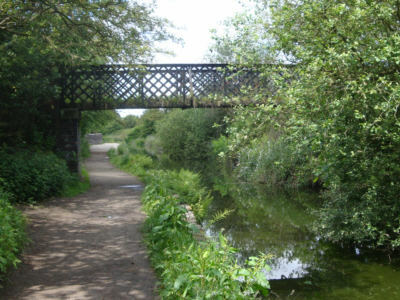 If you are walking the canal route, climb the steps from Crime Lake to the road, cross over and walk straight ahead along the narrow Ashton Road with the remains of the canal on your right. Cross the motorway and continue to Woodhouses village. Turn right onto Failsworth Road. 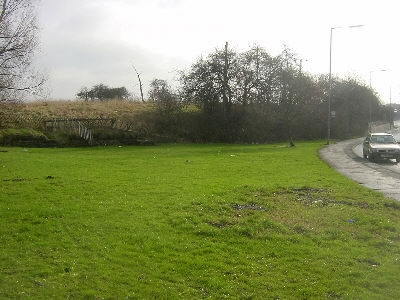 After the houses, look across the fields to your right and see the line of the canal on a small embankment behind a line of trees. As you approach the junction at the north end of Failsworth Road, climb the steps on your right to the site of Cutler Hill Bridge. Cross the road and find the narrow path through the trees that marks the continuation of the canal route. 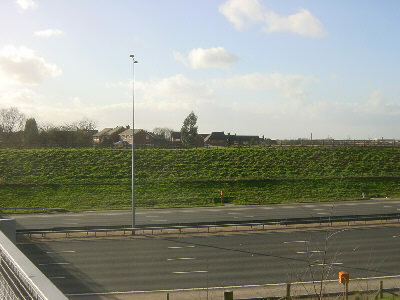 The M60 motorway cuts through the canal route at Woodhouses. 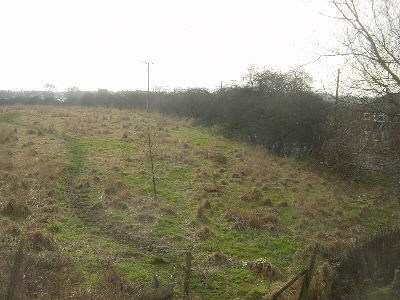 The dried up canal bed near Woodhouses, looking towards Cutler Hill. 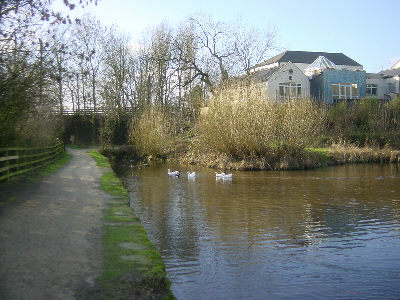 The canal ran on a low embankment behind the trees. Looking south from Cutler Hill. 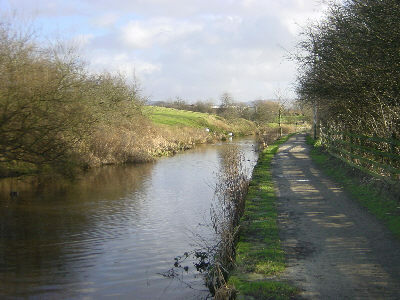 The line of the canal followed the edge of the field, with the line of trees below its embankment. The bridge at Cutler Hill Road survived until comparatively recently, but was demolished as part of road improvements. A public house called the Bay Horse adjoined the canal next to Cutler Hill Bridge.